Starring Paula Patton, Omar Epps, Missi Pyle, William Fichtner, Dawn Olivieri, Luke Goss, and Laz Alonso. A couple on a romantic weekend break are terrorised by a biker gang looking to reclaim something that belongs to them. 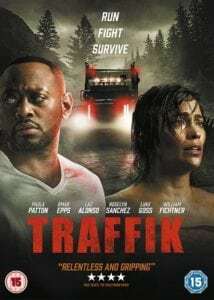 Deon Taylor’s Traffik is essentially a siege/home invasion movie that wants to thrill and horrify you with violence but also wants to inform you, sandwiching in racial and social messages amidst text and statistics about human trafficking. It’s a bold move, and a message that should be highlighted for sure, but it’s all about the execution when trying to pull off entertainment and information at the same time and Traffik, for all of its good intentions, doesn’t quite get the balance right. However, not quite getting the mix right doesn’t mean that it is a disaster. The film sets up its characters very well, with Paula Patton (Mission: Impossible – Ghost Protocol) impressively playing Brea, a reporter who has been told by her boss (William Fichtner – A Perfect Storm) that she needs to up her game and that she may not be the best fit for their company, and on her birthday as well. 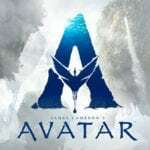 Still, not wanting to put a damper on things the celebrations carry on as Brea and her partner John (Omar Epps – House) head up to a beautiful secluded house up in the mountains for a romantic weekend to get away from it all. Unfortunately, on the way they stop as a service station and fall foul of a biker gang hanging around the shop, forcing John to take action which, in the big scheme of things, wasn’t the best thing to do as that night the gang turn up at the house demanding back something incriminating that they believe was taken from them, forcing the innocent couple to fight for their lives. The biggest problem that Traffik has is that it doesn’t quite know what it wants to be, taking in well-worn tropes from exploitation titles like The Texas Chain Saw Massacre, Straw Dogs and I Spit on Your Grave but holding back on the grisly nature of the violence and looking to beat you over the head with social awareness instead, although it pulls back from that angle just when you think it is going to go all-out. John’s encounter with the gang at the shop escalates very quickly into stereotypical implications about his skin colour, while at the same time Brea is having an encounter with an apparently abused woman in the toilets that plays on her social justice characteristics but, again, never goes as far as is perhaps needed to trigger something explosive. Instead, the confrontation kicks off with a stolen item that the gang, led by Red (Luke Goss – Blade II), are desperate to retrieve and track the couple back to their residence. How do they do that? By employing some convenient modern horror movie clichés that are so blindingly obvious by now that you wonder if the writers aren’t putting them in for comedic reasons. But for all of its plot contrivances and reliance on genre familiarity Traffik is still very watchable. Coming in at a tight 92 minutes it doesn’t have much fat on it and Deon Taylor keeps things moving at a fairly brisk pace. Performances are all solid, especially Paula Patton and Omar Epps, although Luke Goss’ transatlantic accent doesn’t always feel as threatening as it should but he carries off the physical presence very well despite not being the bulkiest or nastiest looking villain of the piece. Ultimately, Traffik is well acted, nicely paced, contains some convincing scenes of violence and looks fantastic thanks to cinematographer Dante Spinotti (Heat/The Last of the Mohicans) but the plot just isn’t interesting enough to put the film above any of the myriad of home invasion-style thrillers currently languishing on all the streaming services. The script does try to inject a little soapy relationship drama when two of Brea and John’s friends show up at the house but that little subplot goes nowhere and is, thankfully, dropped fairly quickly, and Deon Taylor also throws a twist into proceedings for a bit of impact but it’s something you can see coming a mile off and has been done countless times by countless movies before, which again highlights how generic Traffik is when it could have been either an impressively shot violent thriller or something a little slicker with more of a cleverly written social commentary, but unfortunately it never quite embraces both styles enough to fully work as either.